State terrorists in Honduras have learned that to be effective, they can’t just kill and torture. They also have to be able to tell good stories. So here you have the two faces of post–Cold War repression in Central America: “A security company,” which in Honduras is basically a legalized, open-air version of what used to be called a death squad, often staffed by paramilitaries from front-line countries such as Colombia and Israel (in 2013, Cáceres said in an interview that Bustillo personally left threats of sexual assault on her cell phone). And the modern public-relations industry, which human- and nature-destroying companies hire to “overcome reputational challenges among the international community,” as one PR firm, working for one of the most repressive Honduran corporations, put it. For instance, since the release of Jesse Freeston’s excellent documentary, Resistencia, on land struggles in the Aguán Valley, where the Dinant Corporation has been presiding over a regime of terror as it transforms the rainforest into an African-palm plantation (used for biofuels), I’ve been receiving regular e-mails from someone named David Sowells. Sowells works for a DC-based PR firm called Tricuro, on behalf of Dinant (which is owned by the Facusses, one of the richest families in Honduras and very active in the 2009 overthrow of Manuel Zelaya, the coup that Hillary Clinton helped legitimize and which kicked off the latest cycle of repression against activists such as Cáceres). According to Tricuro’s website, the company’s expertise lies in “helping governments to communicate complex and diverse stories to global audiences.” In our postmodern world, state terrorists have learned that, to be effective, they need to do more than just kill and torture. They have to also be able to tell good stories. According to its website, many on Tricuro’s staff have extensive, respectable Beltway lobbying experience. Sowells is a graduate of the London School of Economics and a former public affairs director of CNN International and AOL Time Warner Europe. None of them would have found themselves kicking in the kitchen door at midnight and executing an indigenous environmental activist. The company, Dinant, and the family, Facusse, they represent, however, are involved in extractive operations in a region of Honduras that since the 2009 coup has been a war zone. Between 2009 and 2013 alone, 89 activists like Cáceres were murdered. The two others who were arrested in Cáceres’s killing included an active and a retired member of the Honduran military, Mariano Díaz Chávez and Edison Atilio Duarte Meza, respectively, exposing the public-private nature of Honduran repression. Cáceres’s execution has brought pressure to bear on Honduras, including from the US government, to clean up its act, resulting in a wider investigation into police repression and impunity. According to The New York Times, “a steady drumbeat of assassinations of journalists, lawyers, labor and peasant leaders and environmental activists has come to mark Honduran politics ever since a 2009 coup.” As many have noted, including most recently Tim Shorrock in The Nation, it was the United States—starting with Hillary Clinton’s State Department—that was keeping the beat. Cáceres’s murder took place in an unusually interesting Democratic primary cycle, implicating Hillary Clinton’s unforgivable betrayal of Honduran activists and garnering unusual attention in the United States. But Honduras since 2009 reveals a rot that goes beyond Clinton, exposing the many layers—from resource extraction to military funding and beltway lobbying—that comprise US policy toward Central America. 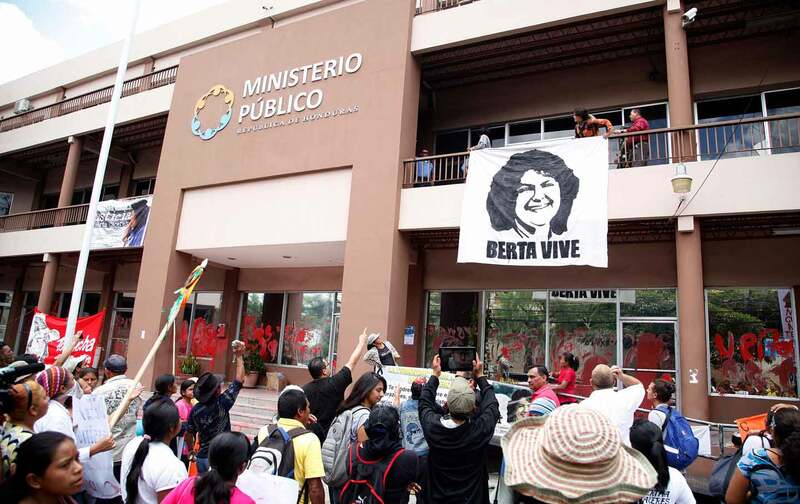 Greg Grandin’s article “Berta Cáceres’s Killers Are Getting Good at the PR Game,” published on The Nation website on May 3, 2016, is erroneous, misleading and defamatory. While there is genuine journalistic merit in examining the tragic murder of Ms. Cáceres, and perhaps at a stretch the same could be said for Dinant’s PR activities (but who doesn’t issue media releases these days to let stakeholders know about the various efforts to improve one’s business? ), the two are not linked in any way whatsoever. By writing a convoluted article that intertwines these two unrelated stories, with an unambiguous headline leaving no doubts about the author’s views, Professor Grandin is deliberately and mischievously connecting Dinant with the murder of Ms. Cáceres. This is wholly unfair, libelous and potentially very damaging to the 8,000 staff and 2,500 independent suppliers of Dinant. For the record, Ms. Cáceres was an environmental activist most noted for her opposition to the Agua Zarca Dam at the Río Gualcarque in Central Honduras. Dinant is a family-owned agribusiness and consumer products manufacturer most noted for producing African Palm oil in the Aguán and Leán valleys of Northern Honduras. Our paths never crossed. As a proud Honduran who has lived and worked in this beautiful country my whole life, I suspect I am more troubled by the untimely death of Ms. Cáceres than Professor Grandin, a history professor residing in comfort at a safe distance in New York, could ever be. Dinant is not simply “getting good at PR,” as Greg Grandin suggests. Rather, we acknowledge, assume responsibility for, and correct our mistakes—professionally and openly—and learn from them. At the same time, we constantly strive to improve and modernize our operations in ways that bring benefits to our businesses and Honduran society as a whole. For example, we have removed all firearms from security guards at our plantations, extraction mills and manufacturing plants—an initiative that is unprecedented in Central America. It is also unfortunate that Professor Grandin did not bother to find out that Dinant planted its African Palm plantations on existing agricultural land that had already been cleared by previous owners for such uses as cattle ranching and banana plantations. No crucial habitat has ever been destroyed or negatively impacted as a result of our plantations, as he inaccurately suggests. There is more that Dinant can and must do to win the trust of the international community. But poorly researched and deliberately misleading articles like Professor Grandin’s do nothing to acknowledge the progress we are making and do everything to harm the tens of thousands of livelihoods in the most impoverished parts of Honduras that rely on our continued operation.